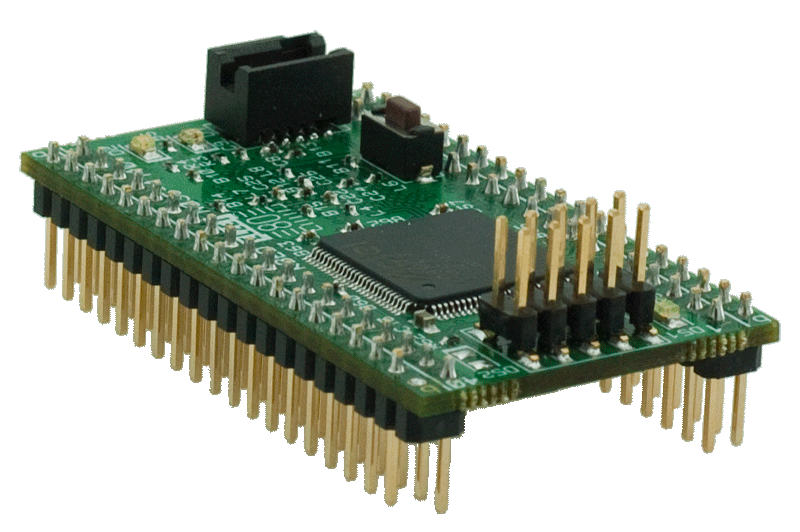 This 512kB Flash 100 MHz ARM Cortex M4 module enables your application for Ethernet and USB - while being an excellent process-i/o workhorse at the same time. The module is mBed-like for the inner 40 pins and takes out a lot more to the outer 40 pins. 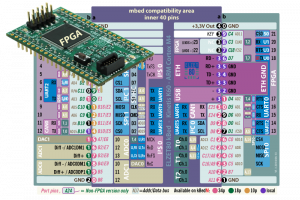 For your speed-ambitious projects an optional FPGA can handle PWMs, counters and special protocols. 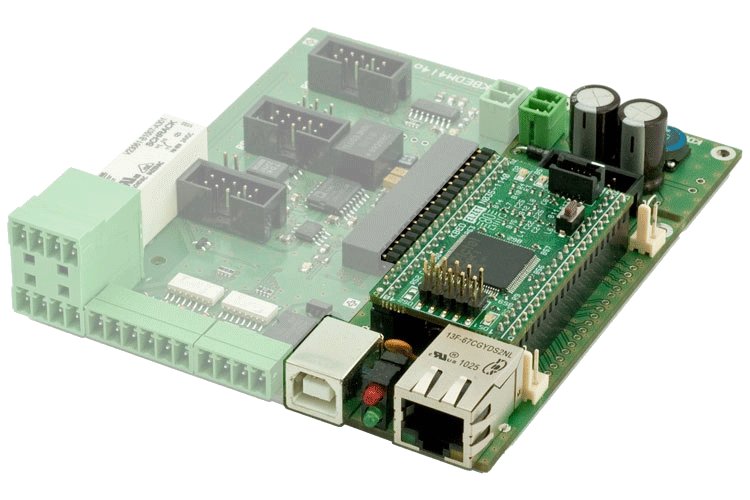 A cheap base module kBed-M is available that allows instant software development. kBed-M seats kBed, adding connectors for Ethernet and USB, a micro-SD-card socket and a serial line connector. Power for kBed can arbitrarily be sourced from USB or from the on-board 24V supply. The µTasker real-time-kernel supports you with TCP/IP stack and web server, FTP or USB file transfer to internal Flash or external SD-card. Programming via Ethernet or JTAG. Remote update using our Network Device Discovery tool. ARM Cortex M4 processor module (Kinetis K60, 100MHz) with 512kB Flash and 128kB RAM, Ethernet PHY and 1MB data flash. 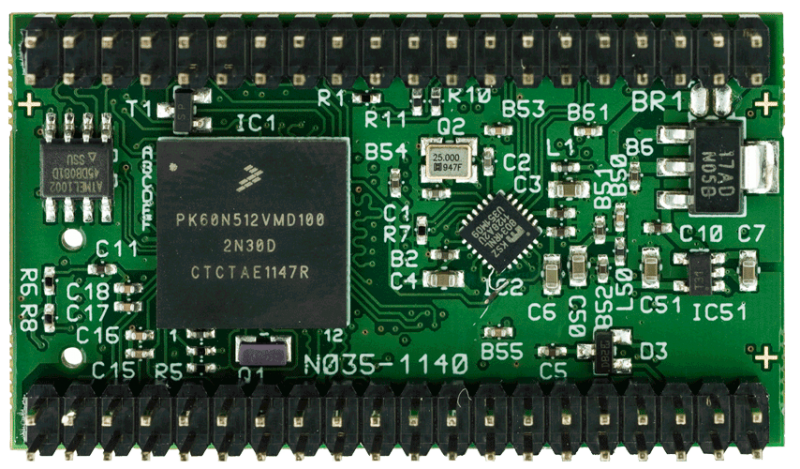 ARM Cortex M4 processor module (Kinetis K60, 100MHz, 512kB F, 128kB RAM, Eth-PHY, 1MB data flash). 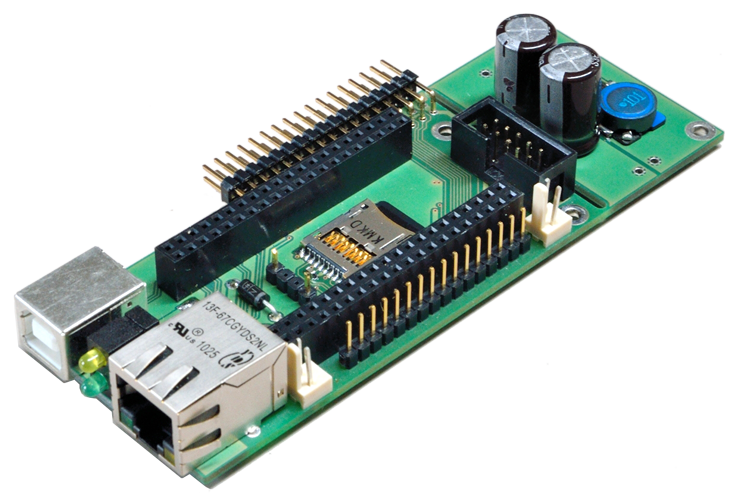 Actel A3PN060 ProAsic3 nano Flash FPGA with 60.000 gates, in-system-programmable. 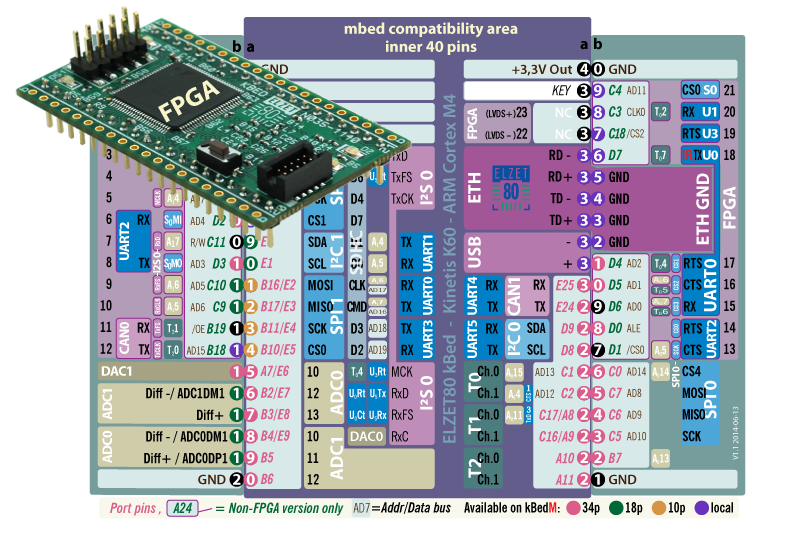 Bigger FPGA up to 250.000 gates optional. Cradle for kBed with USB and Ethernet connector, micro-SD-card and 9..24V power supply. Alternative supply through USB. With demo firmware, micro-SD shows up as drive in Windows' Explorer. Extension to kBedM with relay, four isolated 24V inputs and four outputs, serial drivers for RS485, RS232 and CAN. Currently samples only. kBed is supported by the µTasker real time kernel, it ships with a pre-installed Ethernet boot loader, our "FullDemo" example and sample embedded web pages. Programs written with Codewarrier, GCC, KEIL or IAR compilers (even the free versions) can be downloaded to kBed through its internal web page. The free "Network Device Discovery" tool helps you locate your µTasker nodes in your LAN and may force the device into boot loader mode to upload firmware updates using the boot loader's web page. uTasker is available free for personal or educational use and comes with a low priced, royalty-free license for commercial use. For more information, see our µTasker web page or consult the µTasker web site. 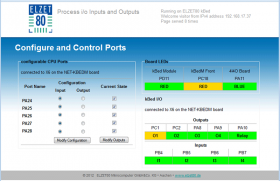 A BASIC interpreter "emBASIC" is planned for release late in 2013. emBASIC will allow you to use kBed with Ethernet and internal or SD-Card file system. It will be programmed by entering BASIC code on its web page. The pdf is a full size copy of the possible pin assignments of the kBed module. 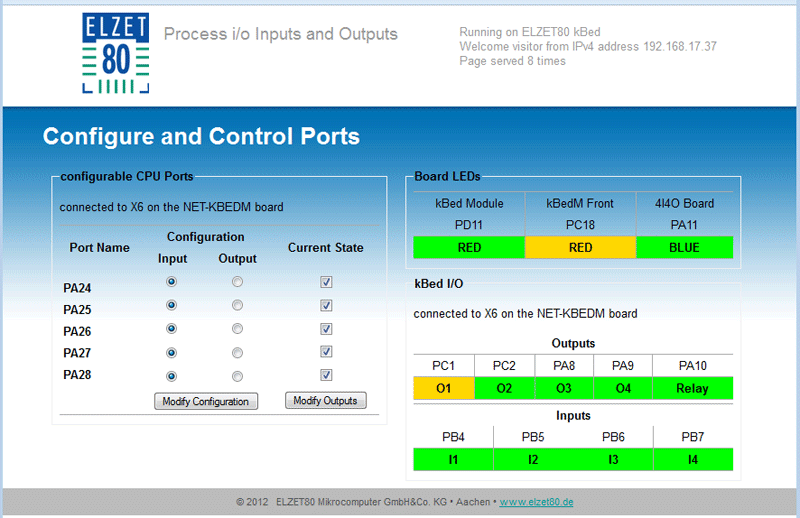 Pin assignments on kBedM cradle as used in FullDemo. Please note that uTasker is very flexible in re-assigning i/o. Usually, this is a matter of setting some DEFINEs. For more information, see our µTasker web page.